A home inspector performs a very valuable and important service. Professional home inspectors examine existing homes using professional standards as a measure to accurately report their condition to parties involved in the real estate transaction. The home inspector does not evaluate the home for cost or value, but reports objectively in writing the condition of the home's systems as they appear and operate at the time of the inspection. A detailed home inspection usually takes two to three hours or longer, depending on the home’s age and square footage. We recommend that you be present at your home inspection so that you can ask your inspector any questions and to look at any areas needing maintenance or repair. 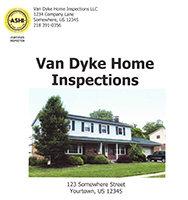 performed by Van Dyke Home Inspections. and air-handling equipment, controls and ducting, etc. Professionally trained home inspectors assist in maintaining the health of your home and a property inspection makes home maintenance easy by catching small problems before they become big surprises. to help them identify any damage resulting from storms, earthquakes, etc. This information was provided by www.homeinspections.com. Questions? Please contact us at (218) 391-0356 or e-mail us at ken@vandykehomeinspections.com.